The conference and workshops were held in Zurich, Switzerland, from 8-12 September 2013. The workshops took place on Sunday and Monday, September 8-9, on the ETH Zurich Downtown Campus (street address: Universitätstrasse 6, 8006 Zurich). 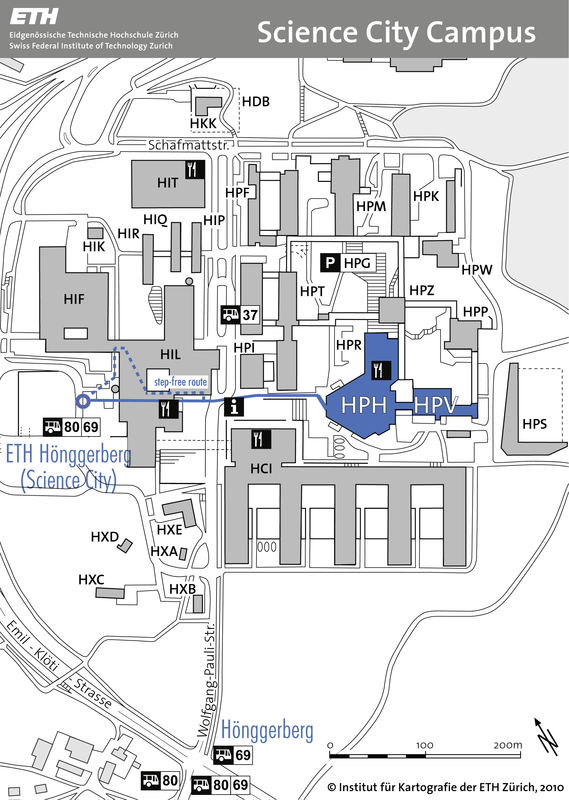 The main conference took place from Tuesday to Thursday, September 10-12, on the ETH Science City Campus (street address: Wolfgang-Pauli-Strasse 14, 8049 Zurich). Below you will find more information about the venues. With a population of some 370,000 inhabitants, Zurich is the largest city in Switzerland. It is surprisingly compact, though, with a wealth of old churches, fountains, and cobbled streets with buildings, some of them more than 700 years old, housing charming galleries and small shops. The city of Zurich was established as a Roman customs post (called "Turicum") in 15 B.C. It is situated some 400 metres (1,340 ft) above sea level at the northern end of the 27 km (17 miles) long Lake of Zurich. Its well-preserved Old Town is to be found on both banks of the River Limmat, which flows out of the lake in a northerly direction. In Mercer’s annual “Quality of Living” survey, Zurich regularly claims one of the top spots, as it does on Monocle’s “Most Liveable Cities Index”. View Ubicomp 2013 in a larger map. *These hotels have rooms accessible for people on wheelchairs. Also, access to the lobby and hotel restaurant is not hampered by the presence of stairs. **These hotels are not equipped to assist guests on wheelchairs. Also, access to the lobby and hotel restaurant is hampered by the presence of stairs. *These hotels have one room accessible for people on wheelchairs. **These hotels are not equipped to assist guests on wheelchairs. Make sure to check out the exact location of the Conference Venue (and how to get there) and the Workshop Venue (and its directions) to find the most suitable hotel location for you. Given the size of the city (compact) and the state of its public transport system (excellent) you should be able to reach either location quickly from most city center hotels. Zurich offers a large number and variety of restaurant and bars. The map below shows places recommended by the Local Organizing Committee. Zurich is extremely easy to reach by train and air, as well as by car. Zurich airport is a major European hub. It is served by over 80 different airlines that offer over 170 direct flights world-wide. The main carriers are Swiss International Airlines and German Lufthansa (through its hubs in Munich and Frankfurt), which through their “Star Alliance” network offer excellent world-wide connections. By rail, Zurich is just 4 hours away from major European hubs, such as Frankfurt, Paris, or Milan. Additionally, direct trains link it to Amsterdam, Vienna, Berlin, and Hamburg, making it possible to reach Zurich from most major European cities with only a single change of trains. Major European highways connect Zurich in 3.5 hours to Frankfurt or Munich, and in 3 hours to Milan. Cities in southern Germany (e.g, Karlsruhe or Stuttgart) are less than 2.5 hours away, eastern France (e.g., Grenoble) only 3 hours, and northern Italy (Genova, Torino, Bologna) only 5 hours. The Federal Institute of Technology Zurich, or - to use its German acronym - the ETH Zurich, was founded by the Swiss government in 1854 as a polytechnic and opened its doors in Zurich in 1855. Until 1969, when the Federal Institute of Technology Lausanne (known by its French acronym as EPFL) was established, ETH Zurich was the only national university in Switzerland. In its core areas of engineering, natural sciences, architecture, and mathematics it is one of the leading academic research institutions worldwide. The ETH itself comprises 16 departments. Over 500 professors and more than 10,000 staff members - with a 30% proportion of women – work in teaching, research and administration. Current statistics of the ETH show 17,780 registered students. Each year about 3,100 receive a Bachelor or Master degree and a further 650 complete a doctoral thesis. Current annual expenditure is 1.47 billion Swiss francs. ETH Zurich regularly appears at the top of international rankings as one of the best universities in the world. 21 Nobel Laureates have studied, taught or conducted research at ETH Zurich, underlining its excellent reputation. The Computer Science department features more than 30 professors from over 10 countries, 200+ PhD students and research assistants, and over 50 postdocs and senior scientists. In research and education, the department covers a broad spectrum of thematic areas with focuses on Software Engineering, Networks and Distributed Systems, Algorithms and Theory, Information Security, Computer Graphics and Vision, and Computational Sciences. The strong links between the department and a wide range of industry and business foster a mutually beneficial climate of academic rigor and practical relevance. In particular, the department maintains a set of long-term research collaborations with such global high-tech players as IBM, Microsoft, Google, SAP and Disney. The campus houses the departments of physics, biology, chemistry, architecture, and pharmacy. It is easily accessible from downtown, as well as the airport, with direct bus lines (lines 80, 69, and campus bus). The conference sessions took place in the physics building (HPH), which offers a number of large amphitheater-style lecture halls, the largest (G1) seating 510 people and two smaller ones (G2 and G3) offering 372 seats each. If you are not located near any of the above stations SBB offers a great route finder/navigator service. For this trip you need a valid ticket for zone no. 110 ("Stadt Zürich"). Tram no. 9 (direction Hirzenbach) or Tram no. 10 (direction Zürich Flughafen) to "Milchbuck", from there by bus no. 69 (direction ETH Hönggerberg) to the terminal stop. Bus No. 80 (direction Bahnhof Oerlikon Nord) to the bus stop "ETH Hönggerberg". Bus no. 37 (direction ETH Hönggerberg) to the terminal stop. For this trip you need a valid ticket for 3 zones. The computer science building (CAB) offers a number of large amphitheater-style lecture halls, two larger halls (G11, G61) with a capacity of 190 seats, one smaller hall (G51) with 90 seats, and many smaller flat seminar rooms with capacities around 30-40 seats. The Environmental Systems Science building (CHN) offers a number of seminar rooms with capacities around 40-60 seats. Tram no. 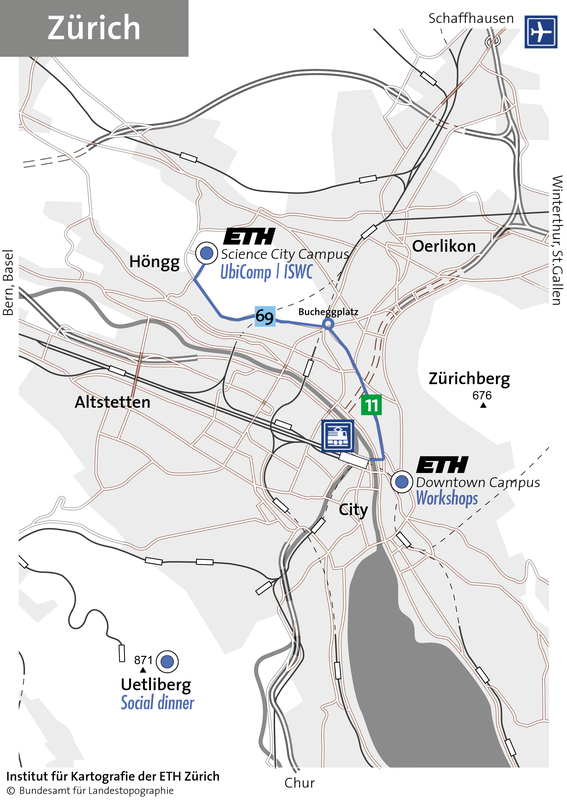 10 (direction Flughafen or Bahnhof Oerlikon) to tram stop "ETH/Universitätsspital" or tram no. 3 (direction Klusplatz) to tram stop "Central" (first stop), from "Central" by Polybahn (departing every 3 minutes) to the Polyterrasse. Tram no. 10 (direction Bahnhofplatz/HB) to tram stop "ETH/Universitätsspital". The tram operates daily from 6 a.m to 11 p.m. with trams departing every 7 to 15 minutes. If you wish to travel from the airport to the city centre (main station), you should travel by S-Bahn or train. The trains leave from the station "Zürich Flughafen". Take tram line 2 towards Bahnhof Tiefenbrunnen. Get off at Bellevue and take tram line 9 towards Hirzenbach. Get off at ETH/Universitätsspital. Take bus line 61 towards Schwamendingerplatz. Get off at Sternen Oerlikon and take tram line 10 (same like from Oerlikon). Complimentary lunch and coffee breaks will be offered every day during both workshops and conference. Workshops: Lunch and coffee breaks are provided every day in the restaurant foodLab (CAB building, floor H). Lunch consists of mixed sandwiches and wraps of fish, meat, or vegetables. Mixed salad and dessert of the day as well as a soft drink per person will be also available. All foods will show gluten and lactose declaration. Please make sure to wear your badge during lunch and coffee breaks. Accessibility: The restaurant foodLab is easily accessible by elevator. Conference: Lunch and coffee breaks are provided every day in the HPH building, downstairs (follow the signs). A vegetarian option will be available. Lunch consists of: a meat or vegetarian dish, a dessert and a soft drink. All foods will show gluten and lactose declaration. Please make sure to wear your badge during lunch and coffee breaks. Attendees that have explicitly expressed vegan, gluten-free, or other preferences in their registration forms should contact catering employees serving food during lunch breaks. They will provide the requested special meals. Please note that special meals will only be provided to attendees that have explicitly requested them in their registration forms. Accessibility: Lunch and coffee will be distributed in the lobby of the main conference venue, downstairs. While it is possible to access the area using an elevator, we recommend attendees with walking impairments to ask Student Volunteers for assistance. The UbiComp / ISWC 2013 Welcome Reception takes place on Tuesday, September 10, from 18:00 to 21:00 at the main conference venue. The Demo Session and the ISWC 2013 Design Exhibition will take place during the Welcome Reception. Accessibility: Step-free access to the lobby of the HPH building is available. The UbiComp / ISWC 2013 conference dinner takes place on Wednesday, September 11, from 19:00 to midnight, at the restaurant UTO KULM on top of the Uetliberg mountain overlooking the city of Zurich. Getting there: Transfer from the conference venue to the restaurant takes about 60 minutes. To reach the dinner venue, please make use of the conference shuttle buses. The buses will depart at 18:00 from the confer­ence venue (in front of the HPH building) to the “Uitikon Waldegg” train station, for transfer to the S10 line. Student Volunteers will provide directions at the station. Train tickets are available in your conference badge. Attendees who are unable to take the shuttle buses from the conference venue are kindly asked to take the urban train S10, departing from Zurich main station, up to the final stop “Uetliberg”. The train ticket available in your conference badge is valid for transportation from anywhere in the city to the dinner venue. Accessibility: A five-minute walk separates the restaurant UTO KULM from the “Uetliberg” train station. Electrical vehicles are available for attendees with walking impairments. Please contact the registration desk if you need assistance. Getting back: Regular trains back to the city leave the “Uetliberg” station every 30 minutes, at 06 minutes and 36 minutes past the hour. The train ticket in your conference badge is valid for the return trip as well. Parking in Zurich is quite tricky. We recommend you to use public transport and leave your car at a parking garage (this might be expensive, though). There are very few parking lots available at the workshops and conference venues and they are liable with costs (payment on-site). Available parking garages close to the workshops venue are shown here. Available parking garages close to the conference venue are shown here. 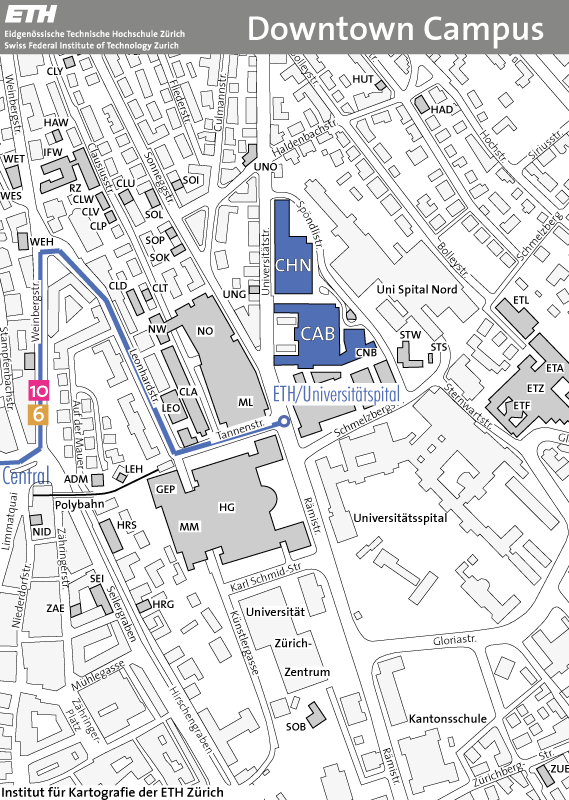 More information about parking at ETH Zurich can be found here (in German). You can also find the parking garages closest to a place you want to go in Zurich using this web site (in German). Information on parking tickets, parking spaces for physically disabled drivers and parking spots around the city can be found here (in German). Step-free routes are available to reach both the workshop and conference venue from the nearest tram / bus station. For more information see the specific paragraphs about workshops and conference venue. Elevators and ramps within ETH buildings make it possible to reach any of the workshops and conference rooms through step-free routes. The transfer to the social dinner might require a special arrangement for attendees with walking impairments. Should you need assistance for the transfer to the social dinner, please contact accessibility2013@ubicomp.org. Special food requests indicated in the registrations forms have been considered. Attendees that have request special meals have been contacted and informed separately. Special meal requests indicated before online registration closes (see: http://www.ubicomp.org/ubicomp2013/registration.php) will be considered. It will not be possible to accommodate for late requests. Should you have any further questions about accessibility of the workshops and conference venues or want to require assistance from the conference organizers, please contact accessibility2013@ubicomp.org. During the workshops and conference days, you can also contact the registration desk directly in the respective venue lobby. For Zurich-wide accessibility questions, the Zurich Tourism portal (the city of Zurich’s official site) is an excellent resource. Since 12 December 2008 Switzerland is an associated member state of the Schengen agreement and hence part of the Schengen area. Please check the visa requirements for your nationality under the following link: Overview of ID and visa provisions according to nationality. Schengen visas are valid for Switzerland and all other areas of the Schengen member states (provided nothing to the contrary is noted on the visa). The Swiss Federal Department of Justice and Police maintains a list of Frequently Asked Questions regarding Visa issues. You can also find links to websites for Swiss embassies and consulates worldwide at the Federal Department of Foreign Affairs. The embassy and consulate websites have very helpful information about procedures, timelines, communities served, required documentation, and fees. Please consider that a visa request might need several weeks or months to be processed by Swiss embassies and that the Conference Organizers cannot provide support on visa issues that go beyond visa letters. Please contact your local Swiss embassy for more information. International registrants should be particularly aware and careful about visa requirements, and should plan travel well in advance. Please send your request for a letter in support of a visa application to (EMAIL ADDRESS CLOSED). Use the subject line “Ubicomp 2013 Visa” and include your name, passport number and mailing address. Also make sure to indicate which embassy/consulate you are applying to. Authors of accepted papers/posters/etc. should also include the title. If you have already registered, please also mention the payment type and any registration fees paid. Please contact us first with the above information before registering.